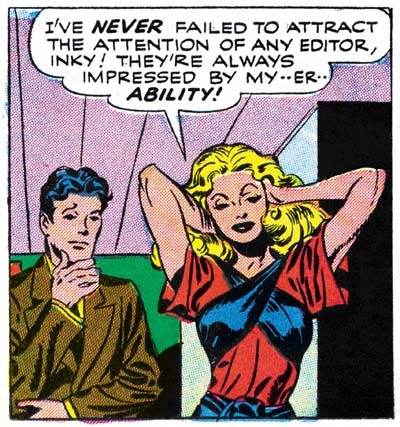 I recently posted on the “Artist Loves Model” story from In Love #3 (December 1954). I appended a note to my blog entry where I admitted forgetting about a post by Bob on the Jack Kirby Weblog about the syndicated strip version of the story. Recently I received a copy of Buried Treasures v1 #2 which includes strips of this syndicate strip proposal. I have compared, panel by panel, the strips to the comic book story. I wrote out all the difference as an aid to my understanding what was done. Just in case anyone wants a blow by blow description I have posted the details. Here I will summarize what was done to convert the syndication strips into the comic book story. The strips opens with Mayor La Flower. We will never see again, he is just one of Cobb’s fans reading his “Old Man Spry” to his juvenile radio audience. This beginning leaves little doubt that there were no earlier strips. The strips end abruptly with Inky going off to confront Donna Dreame about her illicit dealings. Only the comic book version of the story provides the confrontation. But the book story includes a romance angle between Donna and Inky that was not a part of the syndication strips. Had it been drawn, the confrontation scene for the syndication strips would have been very different. Personally I doubt that Simon and Kirby produced any more strips, as a syndication proposal it would have been better for the story to be open ended. The most significant difference between the strip and the comic book versions is the number of art panels that never made it into the comic book story. 43 out of 142 strip panels failed this transition. The first panel from the strip that made it into the comic book was the first one on the sixth strip. This means that 20 earlier panels were discarded. Before the first story page of the comic book was completed a further 4 syndicate panels would be dropped. Thus most of the ignored strip panels come from the start of the story. The remaining unused strip panels do not seem randomly distributed among the comic book pages. 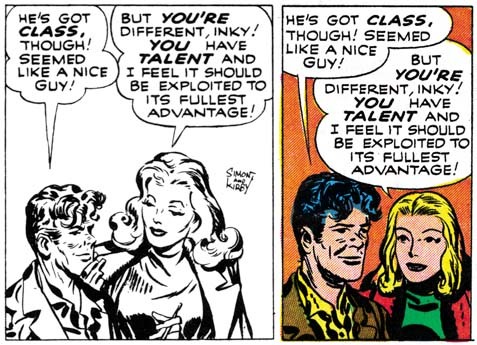 One group is associated with the first and second meeting between Inky and Donna Dreame (8 skipped panels for pages 8 to 10). The next story arc with a number of unused panels concerns Donna Dreame’s hatching her scheme with Half-tone (page 12 with 5 unused panels). The next dropped set of panels combines Half-tone arriving at Donna’s place with his first meeting with Inky (page 13 with 4 unused panels). More importantly the section dropped off concerns Half-tone and Donna coming back from a night on the town. Considering the love angle between Inky and Donna that was part of the comic book story this strip was particularly inappropriate. There are a few single skipped strip panels in other parts of the comic book story. Why so many unused strip panels? At 18 pages “Artist Loves Model” is the shortest of the In Love “novel length” feature stories. “Bride of the Star” had 20 pages and “Marilyn’s Men” had 19. It is possible that the length of these stories was dictated by the number of pages that the backup stories would require and not the other way around. However it seems more likely that strip panels were not used simply because they were not necessary. Even without the extra panels, the comic book version of the story reads just as well as the syndication strips. 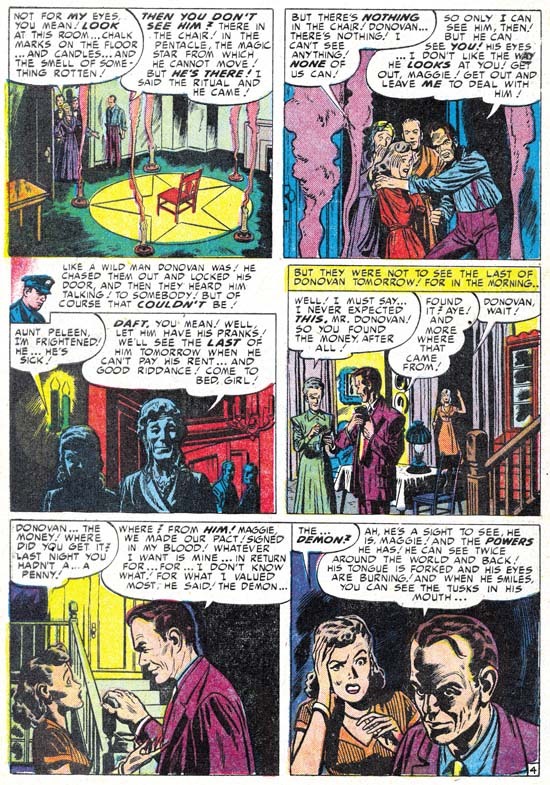 The only negative effect of the dropping of strip panels is the lengthy caption found on the splash page of the comic book. Even Joe Simon criticized it when he recently viewed the splash page. However the wordy caption probably was considered preferable to the 20 art panels it replaces. That would have added over 2 pages without significantly helping the story. It does seem that the initial intent was to include more of the early syndicate strips in the comic book story. In my earlier post I mentioned an used page of art in Joe Simon’s collection. This page was made from some of the panels from the third strip. I was incorrect with my original suggestion that this art page was discarded because it was taking the story into a different direction. I erred due to my misidentifying one of the characters as Jack Hill (because I was working from memory). Now it seems to me that this page was abandoned in order to condensed the story’s beginning even further. Art that did not seem to exist in the syndication strips was added to the comic book. The new art is found in two sections. One is the story arc where Donna Dreame finds out that Inky has used her as a model for one of the characters in the strip they are collaborating on (page 14). A more substantial addition occurs at the very end of the story starting from when Inky confronts Donna Dreame about her dishonest dealings (page 16 through 18). What is significant about these additions is that they concern the romance between Inky and Donna. 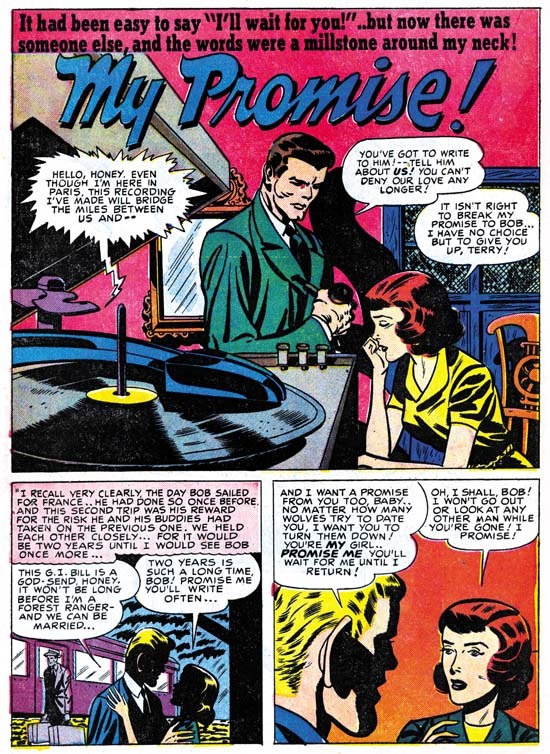 This romance played no part of the original syndication strip and was added to convert the story for inclusion in a romance comic book title. Not all the syndicate panels that did make it into the comic book did so unmodified. The overwhelming majority of strip panels were square. When inserting strip panels into the story 41 of them had their shape altered. 30 panels where horizontally truncated, 10 horizontally extended, and 3 vertically truncated. One of the horizontally expanded panels was used to make a splash panel. This splash was overlaid with another panel so that its shape was no longer rectangular. The new art that was added to expanded panels was kept pretty simple and consisted mostly of backgrounds. Much of the horizontal truncations were done simply by clipping the art. 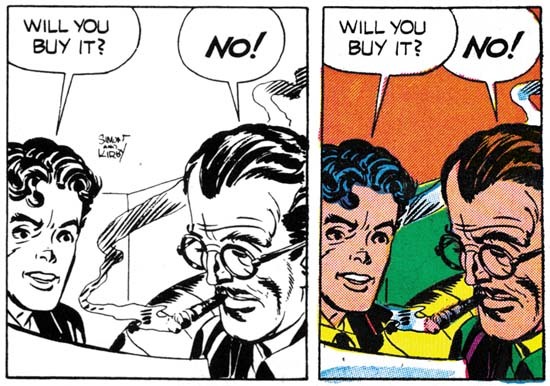 In 2 panels this resulted in the complete elimination of one of two original figures. In 7 occasions where the panel was narrowed horizontally, a character was shifted so as not to be significantly truncated. This explains the unusual cut up nature that I found on Joe’s unused art page. Cutting a strip panel into pieces allowed adjustments to the final shape of the panel for the comic book. It appears that this was done even in cases where in the end the square panel was retained. I was not completely accurate above about all the syndicate strip panels that made it into the comic book. Actually I found 14 panels where the art was redrawn either wholly or in part. None of these alterations changed who was portrayed or significantly modified the pose. Most of the time Donna Dreame was redrawn (12 panels), Inky was the only other character to be modified (4 panels). In the syndicate story Inky was portrayed as shorter then most of the other characters. 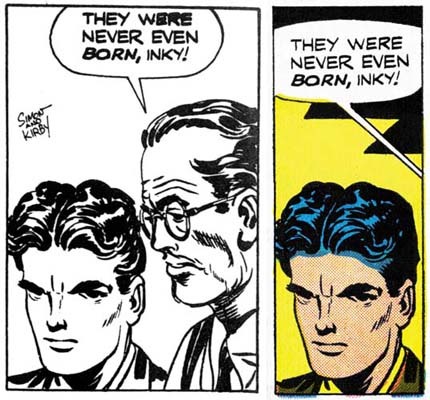 With his short stature and pugnacious nature, I cannot help but feel that Jack Kirby made Inky into a sort of alter ego. The size difference between Inky and Donna may have been fine for the syndicate strips. But this created a problem when romance between the two was added for the comic book, it just would not do to have love between a tall woman and a short man. So in 4 panels Inky was redrawn to be taller. That the romance angle was the reason for this adjustment is shown by the fact that Inky is still shown as shorter then Jack Hill. 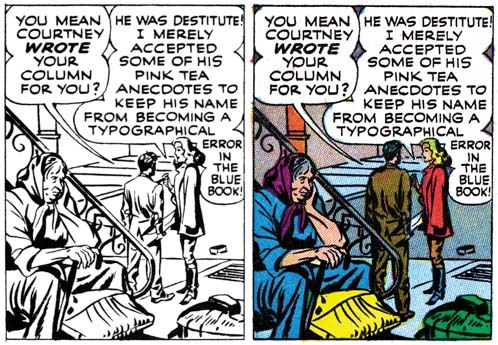 Donna Dreame was altered in a couple of panels as part of the change to reduce her height relative to Inky. That does not explain most of the times that Donna was redrawn. I believe it that these other alterations were done to make Donna more conventionally attractive. Joe Simon once remarked to me that Kirby’s women were not very beautiful, but who cared since Jack drew such great stories. That is a view shared by many others, including Kirby fans. Some have even described Kirby’s woman as ugly. (I hasten to add that I do not share these views and someday I will write a post on why that is.) 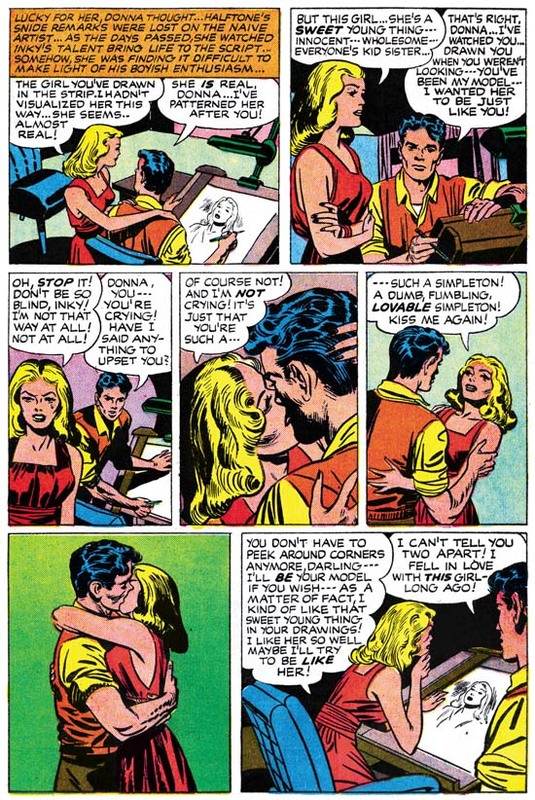 Joe Simon redrew many of Jack’s women when DC republished some of the old Black Magic stories. Thankfully not all of Jack’s drawings of Donna were redone. This is particular fortunate in the case of a panel which is one of the most sensuous images Kirby ever drew (see image below). Sometimes only Donna’s hair was redone, in these cases the hair was simplified. Kirby used “wild hair” as an indication of a “wild woman”, the hair changes seemed to be done to “tame” Donna a bit. All Simon and Kirby signatures were removed. Other art differences between the syndication strips and the comic book are rarer. Four panels have additions to the background. In two further cases a black band with featuring was added to the top of the panel. All occurrences of Donna’s use of a cigarette holder were removed. Most surprising is a name change, Inky Spotts of the syndication strips became Inky Wells for the comic book. Both names are the sort of appropriate naming that Simon and Kirby often used. It is hard to understand why in the end Wells was considered so much better as to warrant the re-lettering needed to alter the story. Script changes were not at all extensive. I have noted only two word balloon whose text was modified. One caption from the syndicate strips was deleted and another one rewritten. 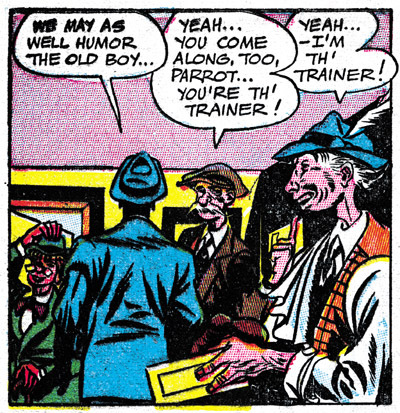 A caption was added to one comic book panel and most significantly 6 caption panels were added to the book version. None of these affected the plot. All caption additions or alterations seem to have been done just to improve the reading. Since I have explained the what and the why of the changes made to transform the syndication strips into the comic book story, the question remaining is who was responsible? 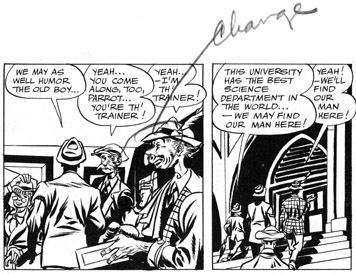 The syndicate strips had all been drawn by Jack Kirby and much, if not all, of the inking looks like his as well. As for the original syndication scripting, although other writers may have contributed, some of it seems written by Jack. The pencils for the new splash page for the comic book was by Kirby but I believe it was inked by Joe Simon. The same very coarse picket fence inking also shows up in the second splash (page 10) where extending the original syndicate panel resulted in the addition of some art. The art added to the other expanded panels also appears to be inked by Joe. The redrawing of Donna and Inky for the comic also looks like it was done by Joe. Some of the writing for the new or altered captions read like Simon’s effort. However some of the other writing is more “flowery” then typical for Joe, so either he was purposely pushing himself in that direction, or another writer was also involved in the re-scripting. The new art was clearly penciled by Jack but looks different from the rest of the story because Joe did the inking. 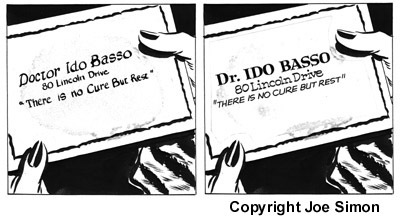 All in all it would appear that Simon was responsible for editing the syndication strips into the final comic book form with Jack providing newly required art. Simon and Kirby did a surprisingly number of syndication proposals. Almost all of them consisted of a relatively small number of strips with un-inked pencils. Yet the syndicate “Artists and Models” consists of 36 strips all of which were inked. More significantly, samples were made by George Matthew Adams Syndicate. It is hard to escape the conclusion that “Artists and Models” was considered as the S&K syndication proposal most likely to succeed. The strips do tell a great story and it is one of Simon and Kirby’s best efforts. But I have to agree with Bob of the Jack Kirby Weblog, that it is hard to believe that a comic strip artist could be the basis of enough good stories to keep a syndication strip going for years. Posted September 23, 2006 in 2006/09, 5 Studio, Alternate Takes, Art Editing, Periods, Prize, Topic, z Archive. 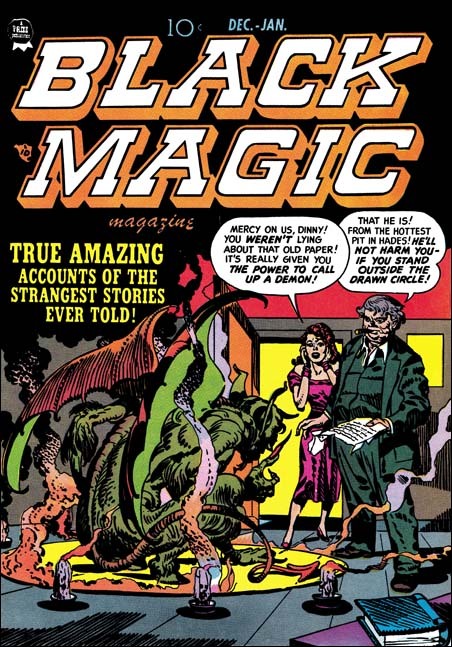 Simon and Kirby produced the earlier run of Black Magic (#1 to #33). 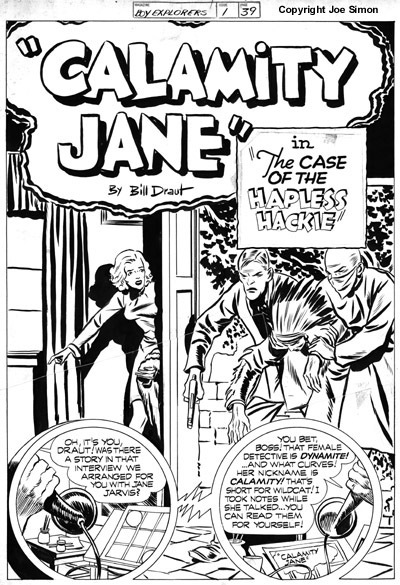 During that period Jack would not necessarily draw stories for every issue but he did all the covers. This means that it was not too unusual for Kirby to draw a cover based on an interior story by another artist. This can provides some interesting comparisons of how different artist handle the same subject. But as you will see in the example I am providing here that there are other possibilities. Simon and Kirby gave great care in the covers for the comics that they produced, and Black Magic #8 is no exception. It provides a complete story in just one image. Minus the conclusion of course, they wanted you to buy the comic to get that. In this cover we are presented with a marvelous demon of the type only Kirby could create. He is crouching, almost as if ready to spring with deadly intend at the first opportunity. The comments of the lady and the old man indicate that the demon was summoned and only the magic circle confines it. The young woman looks astonished and horrified while the man seems a little too smug. You get the feeling that despite the assurances the man gives nothing good is going to come out of what he has done. The story is unsigned but the GCD attributes it to Bob McCarty. I am pretty certain that is not correct. I have not posted on McCarty yet so I do not want to get into an analysis of why I do not think he did this story. For now let it suffice to say that I find Bob to be an excellent artist. Joe has remarked to me that they hired the best artists and in general I agree with him. However this story artist definitely fall into the lower echelon of the shop talent. A story like this requires at some point to present the reader with a good depiction of the demon. This artist only gives us a shadow and even that is not very impressive. Many have made the claim the Kirby provided layouts for the stories that artists drew for S&K. I just do not believe that is true in this case. 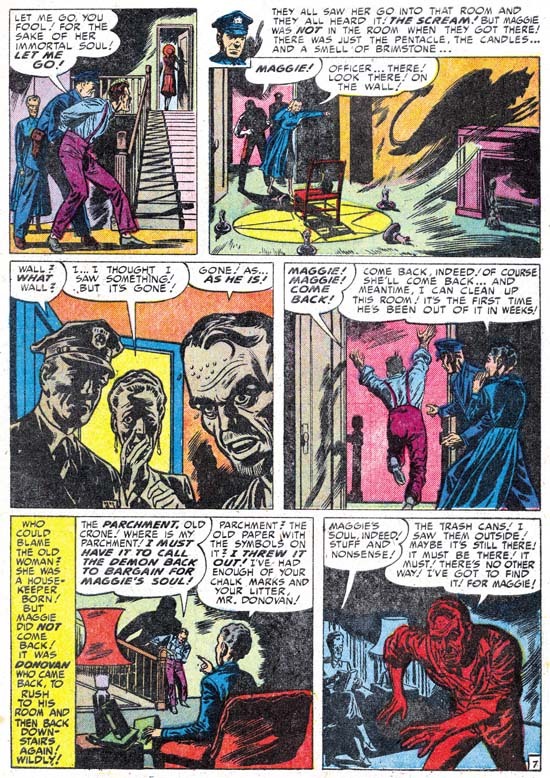 Kirby would use shadows to tone down the affects of distressing subject matter such as a man hitting a woman or a murder taking place. But I do not believe Jack would ever consider only showing a shadow and never the actual demon as was done in this story. Further the layout of the story just does not seem to me to have the Kirby touch. The last panel on page 4 has a marvelous depiction of a women. It is so good that it just stands out from all the rest of the page. Clearly Jack Kirby has once again step in acting as art editor. Considering how poorly the story artist drew this character elsewhere I shudder to think what she looked like before Jack’s rescue. The splash page provides an alternate take from the comic cover. Here, like the women, we do not actually see the demon. But even without the man’s claim that he can see the demon, we know that something unnatural is here. Smoke bellows from the chair without any sign of a fire. It may only be a draft, but the candles’ flames and smoke snake eerily about. Even the chair seems to have a presence beyond that of a mere piece of furniture. The woman was clearly done by Jack and is a good match for the one on the cover. On the other hand the man was obviously drawn by the story artist. Unfortunately he seems overly large compared to the woman. Because of the exaggerated perspective of the rest of the splash, I think Kirby got her size just right. The candles are a recurring motif for Simon and Kirby. We recently saw a similar one in the double page splash from Captain America #8. 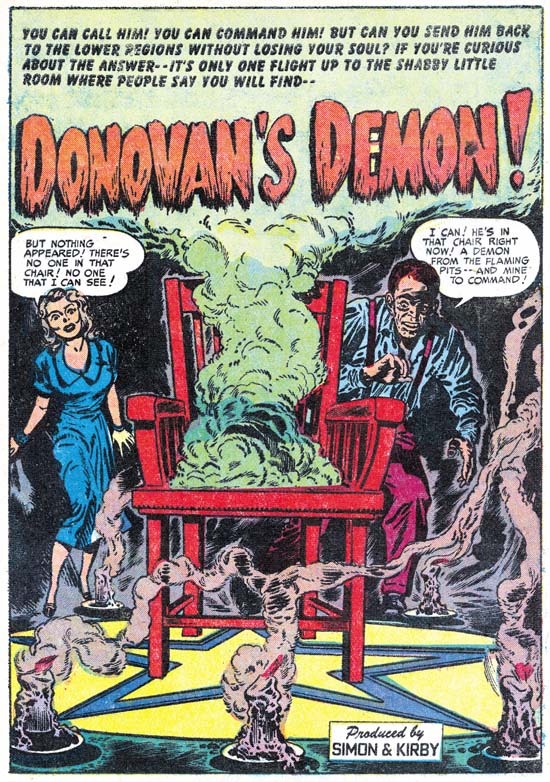 I cannot think of another S&K example of a chair handled quite like the one from this splash. However the exaggerated perspective that is done so well here is a Kirby trademark and seems beyond the capabilities of the story artist. So I would say Jack drew the entire splash except, unfortunately, the figure of the man. So here we have a chance to see alternate takes of the same subject both by Jack Kirby himself. Posted August 18, 2006 in 2006/08, 5 Studio, Art Editing, Kirby Or Not, Periods, Prize, Topic, z Archive. I was going to skip this particular work because frankly it is a bit of quibbling to say the Checklist is wrong. I will explain why I changed my mind later. The Checklist says that 1/2 page of this story is by Kirby. I suspect that this is their way of saying that the splash is by Jack. Well I think that there is little question that the figure of the man was done by Kirby. But the woman is a perfect match for how she is portrayed in the rest of the story. I am certain she was done by the story’s artists and not Jack. Nothing in the rest of the splash looks like Jack’s work to me either. When the inking is examined we once again find that all the splash except for the man has the same style inking as the rest of the story. This style is not the Simon and Kirby shop style either, although in one area it tries to be. The S&K shop style frequently uses an abstract arch shadow. There is something like that between the man and the woman. But I have never seen the shop style turn the arc into an ‘S’ pattern like the artist did here. Further whereas the shop style makes effective use of the abstract arch shadow in the design, the ‘S’ shadow here seems poorly placed. When the inking of the man is examined it looks very different from the rest of the splash or the story. The spotting is done with much more assurance. The spot lines in the jacket sweep further and are effective in both depiction and design. The lines placed in the face and hand have nuances that the story artist just does not seem capable of. Some of the spotting in the hair was done with a broad brush, something not found in the rest of this work. Although the man is missing any of the rows of spots or the picket fence crosshatch often found in the S&K shop inking, it is otherwise a perfect match. The artist draws rather large and poorly placed ears when viewed from behind. It may just be a quirk of the artist, but it was something the Jack Kirby also did during the war years. The rest of the face is not like what Jack did so my suspicion is that the artists was using old Simon and Kirby comics as an aid to drawing those parts he had problems depicting. Two possible explanations for what happened here. One is that the story artist did a close swipe of a Kirby figure for the man in the splash. I do not like that explanation because of the inking which have subtleties that seem beyond the ability of the story artist. The other explanation, and the one I accept, is that Jack has stepped in here in his role as an art editor. The man plays a crucial part of the splash and I suspect the story artist did not do a good enough job on him. Kirby redid the figure but used restraint in the inking so as to blend in better. It is as an example of Kirby as art editor that made me reconsider posting on it. Posted March 17, 2006 in 2006/03, 5 Studio, Art Editing, Harvey, Odds & Ends, Periods, Topic, z Archive. Joe Simon and Jack Kirby not only created great art, they produced great comics. They would hire writers to make scripts and artists to illustrate them. Joe and Jack would deliver to a publisher a complete comic ready for the printing. During the process of working on these comics they would improved both the scripts and the art. In the end they were Simon and Kirby comics even when other artist did most of the art for the stories. I thought I would share some examples of Joe and Jack as editors of other artists. 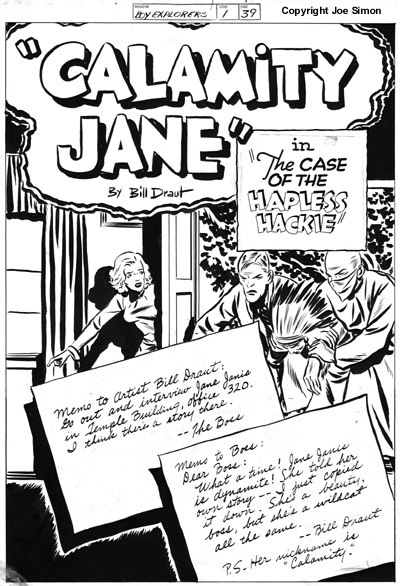 The first is from a “The Case of the Hapless Hackie” a Calamity Jane story by Bill Draut from Boy Explorers #1. Bill was a regular of the S&K studio and I am sure I will talk about him often. The original art, still in Joe Simon’s collection, was done on illustration board. These boards are thick (about 1/8 inch) and were the staple of work done for S&K productions. But the art on the bottom of the splash page of this story was done on bristol that was taped to the illustration board. With the bristol removed you can see the art as it was done by Draut. As you can see Bill did a good job and the notes by the editor and the artists was a clever idea. However the notes and the title clutter up the page and leave only a thin strip for the art. I believe for this reason and to modernize the effect, Joe did the overlay showing the editor and artist talking by phone. This is the version that was actually printed. I say Joe did the editing in this case because the art was done in his style. Bill did a good job, but Joe made it much better. That was not the only change done on this page. The story title was done on paper pasted over the illustration board. The paste still holds the paper down tight so I have no idea what change was made. A similar paste job was done on the third panel on page three, but this time the glue has failed and the scan below shows Draut’s (left) and the final (right) version. Frankly this time I do not see the final version as that much of an improvement on Bill’s take. The Boy Explorers and Stuntman comics did not last long as they were victims of the comic glut and resulting crash at that time. Boy Explorers #2 and Stuntman #3 never reached the news stands. But small (1/4 sized), reduced length, black and white versions were mailed to subscribers. I borrowed Joe’s personal copies for scanning and found this on the top of page 18, the third page of “In This Corner Kid Adonis” by Joe Simon. I think that is Simon’s handwriting, so it seems he was not satisfied with the face on the person on the right in the first panel. This particular story was reprinted in Green Hornet #37. This time the person has a very different nose. It seems Joe was not above editing himself. One casualty of the comic crash was a Vagabond Prince story “Trapped In Wax” by Joe Simon that had been scheduled for the Boy Explorers #2. This particular story did not make it into the small comic sent to subscribers. Perhaps because there were still a few places where the inking had not been completed. In fact this story was never printed until Greg Theakson included it in Stuntman reprint. 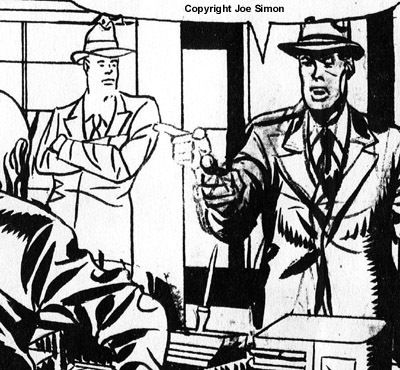 Below I include a close up of the first panel of page 7 of the story from a xerox in the Joe Simon collection. Notice there still remains a ghost of the pointing hand. The final hand was redone in a style that is unmistakenly that of Jack Kirby. The man’s right shoulder has also been adjusted. So here we have Jack stepping in as art editor. Careful examination of Simon & Kirby productions show that it was not unusual for Jack to make this sort of corrections.